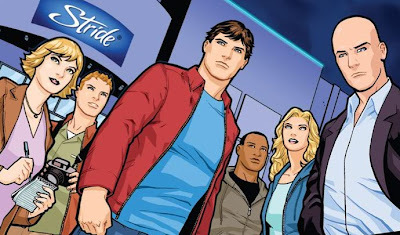 As unlikely as this sounds, Smallville will be entering its eighth season this fall. This means it outlasted Buffy the Vampire Slayer, The West Wing, The Sopranos, Star Trek: The Next Generation, Veronica Mars, Arrested Development, and a whole hell of a lot more acclaimed shows. Lex and Lana are leaving the cast, which makes the list of people who are no longer on a show called Smallville, who really should be on a show called Smallville, a little bit longer. That seems kinda wrong to me. Also, Lionel Luthor is gone. So, really, what's the point? Well, at least Chloe is still around. And apparently Supergirl isn't going to be back. Er, I mean...I don't still watch Smallville.